My vampires-attack-a-prison novel LIGHTS OUT is now available from Thunderstorm Books.Â Thunderstorm is doing something a little different with this one, releasing it as a signed hardcover limited to 140 copies, but with an affordable cover price of $35.Â It’s a great little package, and I think it’s a step in the right directions, allowing both collectors and casual readers in on the ground floor. 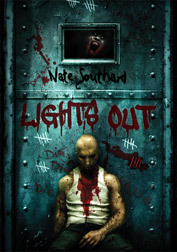 Creatively, LIGHTS OUT is probably my favorite work to date.Â The characters that inhabit the novel are some of the richest, grimiest bastards I’ve ever conceived, but there’s a core of humanity to (most) all of them that makes for some fun, brutal good times. Burnham State Maximum Security Penitentiary holds the worst criminals humanity has to offer. Murderers, rapists, and others who have preyed upon humanity populate the prison, creating a food chain of violence and fear. Something lives beneath Burnham, however, and after years of waiting, it has been set free.And it is hungry. Cover by the amazing Vincent Chong. Hey Mr. Southard, just ordered this and I’m really fired up to read it. I first read your work in the recent demon anthology and I thoroughly enjoyed Mr. Gray. I’m looking forward to picking up all your new stuff! Pretty sure i got my copies in the mail today. Ill find out in a few hours when I get home from my soul-sucking job. 🙂 Ill let you know what I think in the next day or 2. Im putting everything else Im reading down for a few days….. I plan on blasting thru this one. Hey, Kevin. Sorry I didn’t reply sooner. Yeah, Anton Ribisi is the same Anton Ribisi mentioned in Red Sky. Just having a little fun. Since this edition is largely for collectors, I’d be a little surprised if it showed up in libraries. Might not hurt to point your local library to the Thunderstorm Books website (www.thunderstormbooks.com). It will probably be a while before there’s a more affordable edition available. Sorry.